About one out of every four departure and arrival flights at airports in northern China was delayed in the first half of 2011, according to statistics released on Monday by the Civil Aviation Administration of China (CAAC). 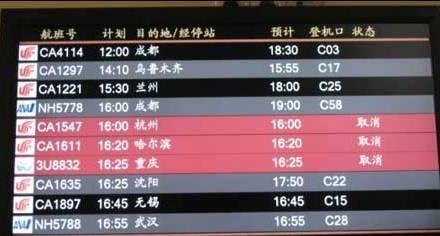 Only 74.99 percent of arrival and departure flights took off on time at airports managed by the CAAC North China Regional Administration during the first six months of this year, up 0.77 percentage points from one year earlier, said Pan Wanying, an official in charge of aviation management with the CAAC. Airlines were to blame for more than one-third of the flight delays, according to data from the CAAC. Air traffic controllers caused 24 percent of the delays, while military activities contributed to another 23.02 percent, the CAAC said. Adverse weather was blamed for 16.8 percent of the delays, according to CAAC data. Nine of the CAAC North China's airports reported on-time rates of 80 percent or greater, the CAAC said. At the Beijing Capital International Airport, China's largest airport, only 76.76 percent of scheduled flights took off on time, the same rate as last year, according to the CAAC. The airports of the cities of Tianjin and Shijiazhuang held the worst records for flight delays, with on-time rates of 65.41 percent and 65.52 percent, respectively.